Thomas Francis University is a metaphysics school that offers online metaphysics and spiritual Bachelor's, Master's, and PhD Doctoral degrees, parapsychology degrees, life coaching degrees and certifications, spiritual counseling degrees and certifications, metaphysics certificate courses, metaphysics classes, life-skills courses, paranormal investigator certification, relationship courses, leadership training, hypnosis degrees, hypnosis certification, Reiki classes, Tarot classes, and more. Affordable tuition plans available. All metaphysical distance-learning, online courses, and metaphysics degree programs are self-paced. Why Choose Thomas Francis University? In days gone by, the only way for students to go to college was to attend in person on a physical college campus. But since the early 1990’s, much—if not most—of the world has come to rely on one of the greatest inventions that humanity has ever devised: the Internet. Never before has so much information, knowledge, and opportunity been so freely available to the common person, and never before has a vehicle existed that has had the potential to bring together and unite masses of like-minded individuals with common objectives. The Internet is not only a vast library of human knowledge; it is a vast network of individual human experiences. Along with all the changes in technology we have seen over the past two decades (in particular), people have grown and adapted to new ways of doing things, and this includes how they receive their education. Academic colleges and universities have seen the value of online learning for many years, and most of these institutions offer some type of online campus for students who are not able to attend college in person. Thomas Francis University has taken the same approach in order to reach more students the world over. Rather than invest in and operate an expensive onsite physical campus, TFU utilizes an online campus where students can benefit from the convenience of studying at home or wherever they happen to be, and at their own pace. Maintaining an online campus allows TFU to offer comprehensive, quality metaphysical and spiritual training at a much lower tuition rate. One hundred percent of what you need is contained in the respective online courses including exams. As the primary part of our online campus, all TFU students have access to an individual Dashboard as the main portal for their studies. The Dashboard provides access to all enrolled courses, orientation and how-to video tutorials, etc. All TFU enrolled students can join our Facebook-like online social network. This is great for connecting and interacting with other students as well as instructors. Friends and family of students can also join with an invitation from the student. Share inspiration, photos, videos, audios, blogs, and post in the forum. A link to register is provided in the Dashboard. 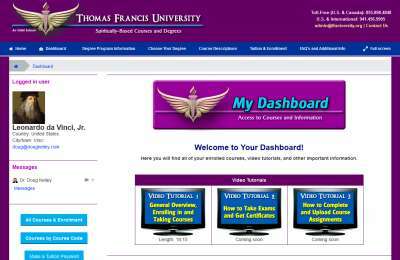 Thomas Francis University is a metaphysics school that offers online spiritually-based Bachelor's, Master's, and PhD Doctoral metaphysical degrees as well as single, standalone courses in related metaphysical and esoteric topics. Instructors are easily accessible and offer World-Class customer service and instruction. TFU and other ICMH Schools have 1,000 students and graduates in more than 60 countries worldwide. Click Here for more information. © Copyright 2015 to Present, International Church of Metaphysical Humanism, Inc. All rights reserved. Thomas Francis University is an educational program of the International Church of Metaphysical Humanism.